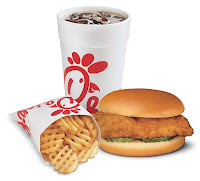 It seems every Sunday I get a craving for a Chick-Fil-A sandwich. Of course that’s the day of the week they are closed. I know they are closed for religious reasons (the founder is a devout Baptist), but it also seems to be a good marketing technique, at least on me. Makes me crave it more when I can’t have it. I first experienced a Chick-fil-A sandwich while working on a consulting project in Salt Lake City about ten years ago. I went there every day for a year practically. Chick-Fil-A has over a thousand stores and $2.5 billion in sales annually. Truett Cathy opened the first Chick-Fil-A in 1967 in a mall in Atlanta. The company claims to be the first to offer a boneless chicken breast sandwich, and the first to sell chicken nuggets nationally. A large part of Truett’s business and belief system is giving back to others. Consequently, he established the WinShape foundation more than twenty years ago. The foundation operates several foster homes, offers college scholarships, and offers long term family care for boys and girls. Climb with care and confidence. Don't overextend. Create a Loyalty Effect. For employees, restaurant operators, and customers. Never lose a customer. The most effective advertising doesn’t cost anything but a bit of kindness to your customers. Put principles and people ahead of profits. Be part of the community and give back.